I hope to add more names before Sat. Not sure how much internet time I will have after Wed. but definitely will be taking the lap top because I am slightly addicted to it. Tonight was my last interval workout before the marathon on Sat. I fully expected it to be a solo track workout. To my surprise Charles showed up to run with me. He wanted to help me with my final workout. So nice! So we warmed up for a mile. Just as I was starting to run a few strides, Jodi arrived. Nice! Melissa was also on the track doing her own workout, and later Susan and Eric showed up. So I finished the strides and started my 11 X 400 workout. I ran the first one, and then Charles joined in for the next 8 or 9 400s with me. I averaged 1:44 for the 11 400s. After Jodi finished her warm up she joined us for several 400s also. So nice to have company for this final workout before the marathon on Sat. Jodi will be running the Chicago marathon in 2 weeks. She will have a great race. 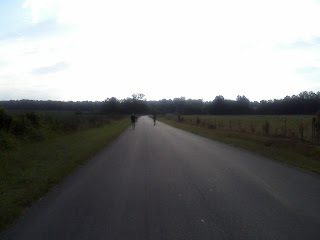 Charles, Eric, and I ran the 1 mile c/d down. I ended the night with 6 miles. We finally had a cool front last night so the track workout was so nice. Again tonight, I feel strong and ready to run on Sat. Looking forward to it. It will be fun, hard, beautiful, challenging, awesome, invigorating, agonizing, mind boggling, exhilarating, ..... I feel strong, I feel ready, I am tough, I can PR on Sat. Send some good thoughts my way Sat. - Adopt a mile. So Sat. is the BIG day, St. George, Utah marathon (26.2 miles). I feel ready to go. I thought a fun way to get my friends involved would be to ask you to adopt a mile. Miles 18-26 are the tough, brutal miles - duh! So I am asking that each of you pick a mile. If things go well, I should be at mile 18 @ 8:27 am mountain time (9:27 am CST) this Sat. Oct. 3rd and @ 26.2 around 10:40 am mountain time (11:40 am CST), if I have a GREAT day. This is according to my pace chart, and depends upon the race starting on time, and if things go as planned, etc. etc. If I am on pace at that point, each mile will be around 9:00 min. apart, after mile 18 @ 9:27 CST. I want specifics (ex. Amy - mile 22, Sarah - mile 18, etc.). If you have run a marathon previously, I have to ask you to step up and send good thoughts for each of the miles, 18-26 - 9:27 CST - 11:40 CST, or later. You know exactly what I'm going through so send extra good vibes my way. You can either list your name and mile under comments here, or you can list them facebook, twitter or you can send me an email. I am hoping to have a few friends "with me" for each of the final miles. Will be needing some good thoughts at this point of the race. Let me know if I can count on you on Sat. Well, I did decide to run a 5k but I changed the plans a little. 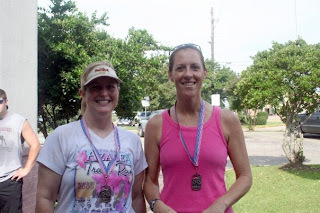 Originally, I was going to Biloxi because it would be a flat 5k and I "might" have a chance to pr. During the week, I realized my "typical non luck" with weather was in store (no cool front), so I decided to go to Laurel to run the South Central 5k. It was closer to home. With the heat, a pr was basically out of the question. 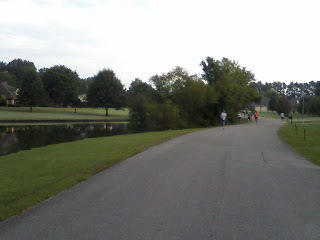 The 5k in Laurel has rolling hills. So Audrey and I warmed up for 1.5 miles and then we started racing. The first mile was on pace for a pr. 7:24. Very soon after the mile, I quickly realized it would definitely NOT be happening today. So with the heat at 75 degrees, real feel at 85, and 92% humidity, I decided to let up just a little, and get on my marathon tempo pace of 8:00. So for mile 2 - 8:03 and mile 3 was 7:58. :48 for the .1. Total time for the 5k - 24:15. Last year I ran 24:01 at this race and I am sure that was "all out racing." My friend Terry won the race. My friend (evil friend) Audrey beat me out of the Masters. (not in the pic) (Congrats Audrey!). My friend Frank - as always, taking great race pics. Sunday was my last mid length run before the marathon. Today I headed out for an 8 mile run. It was so nice. Yes, it's still hot, but for the first time in about 2 weeks, the sun was out. Thoroughly enjoyed the run, easy pace, and lots of wildflowers along the way. Thinking about the St. George marathon during the run - good thoughts! 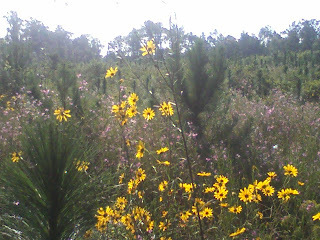 We have been blessed with 2 weeks of rain, and now we are blessed with pretty fall wild flowers. Awesome 800's / Peaking Perfect Maybe???? On cloud nine tonight! Went to the track tonight to run Yasso's 800s. 1 mile w/u, 10 X 800, 1 mile c/d with a 400 recovery between each 800. Went to the track at 5:15 tonight. It was sprinkling, but that made it perfect. Without the sprinkles it would have just been the regular, you know it, hot and humid, but with the light rain it helped to keep me cool. We had a few brave souls that showed up for their workouts. Susan, Dawn, Vicki, and I started warming up. Vicki and I both needed to run 800s, Dawn was running 3 X 1600, and Susan was doing "her own thing" (not sure). It worked out great for me. Vicki needed to do 5 X 800 when she finished her 5, Jim and Kily showed up just in time to help me finish the last 4, perfect timing. It really helped to have them with me on those later repeats. It would have been lonely on the track if they hadn't been there for me. Thanks guys! And thanks to everyone else for showing up in the rain. Oh, I almost forgot, the data. I averaged 3:50 for the repeats - 3:48, 3:53, 3:52, 3:48, 3:48, 3:50, 3:50, 3:52, 3:50, 3:46. This will be my third attempt at Yasso's 800s. So far they haven't really worked as designed for me, not even close, but I like the challenge of the workout. In Jan. I averaged 3:45, for the 10 X 800, and then ran Houston in 3:59. Maybe "the 3rd time is the charm." Let me just say, I FELT AWESOME. I felt strong. Some of the runners were talking about how they felt bad - legs hurting, breathing issues, etc. I didn't say anything because I wanted to say "I feel AWESOME." but they may have slapped me, and it was early in the run so I decided I better keep my mouth shut. As it turned out, I felt GREAT the whole workout. My last few "hard effort" runs keep getting better and better. It feels like I may actually be peaking at the perfect time (keeping my fingers crossed about that). Still deciding about the 5k, but if I had to guess, I would say it's probably a yes. Even without the cool front (the cool front is supposed to come on Monday - 2 days to late). Today, I just want to run it. If I feel the same, later in the week, I will go for it. 20 miler and Taper Time! GREAT week of training! Thurs. Chad was meeting a friend to run @ Jackson station so I rode with him and would begin the long 21 miles home. 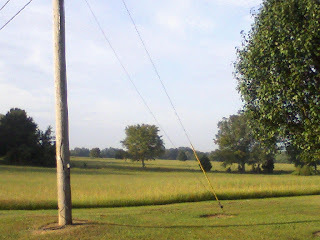 Typically, I run it from the house to the Jackson Rd. Station. That way, I run my hills first and then when I get to the trail at Epley station, the last 7 miles is flat. Today, the reverse worked in better with Chad's schedule so that was ok with me too. This pic is not from my run on Thurs. but it is a pic of the trail. Didn't get started until 6:40 and the start temp was around 73 degrees with a real feel of 77. 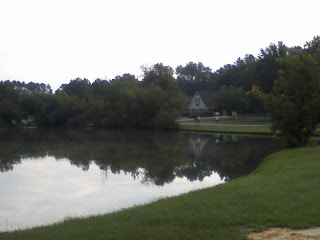 The late start put me finishing the run around 10:00 am, 78 degrees with 86 degree real feel. Fun Stuff! Always, always remember, what doesn't kill you makes you stronger. (it's Sat. and I survived the run) I had another good run. 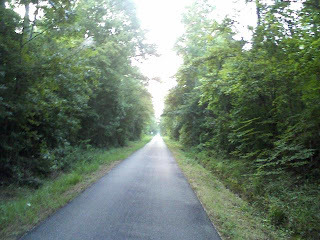 Wed. evening, knowing how hot and humid it would be, I bailed on any attempt at a pace run. 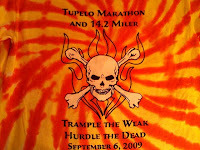 My previous plan was to run the Tupelo marathon slow and then run this last long run at race pace. O'well, I have been wanting to test the lsd runs again, so I have officially had more lsd runs than pace runs in training for St. George. I averaged 9:28 pace for the 20 miles and then walked the last mile home. Funny of the day - just finished the 20 miles, and started walking the last mile home. Really tired. I have my headphones on - the DJ says, up next Alice in Chains has a new song out, I was curious. The song ... "Check My Brain" How appropriate! Went to yoga Thurs. evening. In fact, I made it to yoga every day this week, Mon - Sat. One more week of unlimited yoga. Friday was yoga and easy walk 30 min. Friday night - the 5k bug hit me for a couple of reasons. I haven't raced one since July. Most of you are just getting acquainted with me and my blog. Let me just say, that is a long time for me to go without running a 5k. In training for St. George, I made an early decision to do fewer races. Again, ????? who knows which way is better. The other reason to run, a much better reason, the race was to raise money for a little boy who was diagnosed with brain cancer. So Sat. am, off to the races. Both of my biggest race "pet peeves" happened at the race today, but when you consider what the family of this little boy is going through, you just have to "let it go." (late race start and short course - hate it) So I ran 23:00 for 3.04 miles, 7:34 pace. When I enter 7:34 for a 5k, I get an adjusted time of 23:27. *pr was on a FLAT course, this course was rolling hills. *I haven't done any 5k speed work - I need 200s & 400s to get "5k fast"
*not in 5k race shape - I need to run several 5ks to get in "5k shape"
*I ran 20 miles on Thurs. So now my dilemma. 21 seconds is a LOT of time in a 5k, but I am feeling really good. I have already started the internal debate about trying to pr in the 5k next weekend. There is a flat one in Biloxi next weekend. The dilemma is - that will be 1 week out from St. George. Hmmm, what to do? *need a tempo run next week - the 5k will be close enough to my tempo run, right? *currently they are predicting "dryer" weather for next weekend. *I have 800s on Tues. which will be a little bit faster than mile repeats ie better 5k training. *maybe rest, but I will need to run a 5 mile tempo run anyway. 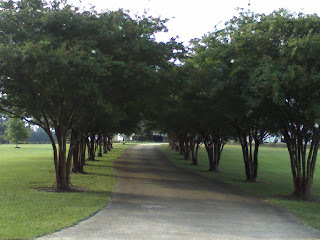 Sunday am - will be 4 easy miles with my friend, Missy, to finish my 40 miles for the week. Looking forward to "catching up" with her on the run. We did endure the yoga/pilates class this morning together, but not much time to chat. Next week - around 25 miles, 10 X 800 on Tues., 5k or tempo run, 8 mile long. Yoga - 4-5 times. Need to be sure to taper the food this week too. That's the hard part, my appetite will still be high, but with the lower mileage, "gotta be careful." 13 days to go! Rainy mile repeats and unlimited yoga! Monday - tough, tough workout today. Headed to the trail today a little after 8:00am. The plan was to get a total of 7 miles with a 1 mile w/u, 5 X 1 mile repeats, and 1 mile c/d. So I started and headed down toward USM. While I was in my w/u mile I saw Tracy H. and Michelle M. probably finishing up their long run in preps for an upcoming marathon. I finished the mile w/u and ran the first repeat 7:42, still heading toward USM. Nice to go down, when running mile repeats (you know mile repeats are my favs, NOT.). Unfortunately, if you start out going down, eventually you have to turn around. 2nd repeat 7:41 heading up, ouch! By the time I started the 3rd repeat, "the bottom fell out", pouring rain. It is always my intention to run with "whatever the weather gives me" for the day. My philosophy is, it may be this exact weather on race day, so I need to get accustomed to running in it. You see, I am a totally lucky and thankful girl when it comes to my running, training, health, life, etc., BUT I am NOT so lucky on race day weather. Normally, it's a "heat" thing, but who knows, this time it could be rain. So I continued on with my run. Shortly after, my good intentions gave way. With heavy shoes, heavy legs, and heavy breathing, I caved at .68 still at 7:45 pace. Ok, I will just do 2 800s, and then my other 2 mile repeats. I tried "pulverize the monster", "light as a feather","strong", "finish the workout" but my internal monster won out. Dang it! So I walked back to Jackson, got some water and regrouped. Tried waiting for the rain to let up a little, it did slack up a little, but I decided I needed to move on with the workout. So I did 2 more repeats, 7:42, and 7:51, 1 mile c/d and 1 mile walk. So this is good and bad. Great that I finished the planned workout, kind of (too much rest between later repeats). Not so great that I let the weather "get me." This is exactly what I am talking about "improving my mental toughness." Soooooo need to learn to push through this kind of "stuff." This evening I lifted weights, core work, push ups, lunges and squats, and I will head to yoga this evening. It's a new yoga, pilates infusion class. 2 more weeks of unlimited yoga classes. It's really hard to make it to so many classes, but I am getting stronger each week, at a rapid pace. Tues. - the yoga pilates infusion class was great. It was very targeted working on the core, inner and outer thighs - exactly what I need. Sore today, but a good sore. Today, I ran 4 miles on the treadmill, easy pace, 10:00. It's been a long, long time since I have run on the treadmill, not too bad. Then this evening I went to serenity yoga. Awesome! Wed. will be an easy day gearing up for 18-20 on Thurs. Looking forward to it. The weather is going to be HOT and HUMID, but other than that, I am excited about the last long run prep before SGM. Taper time starting Thurs. pm. First I must set the record straight. Hubs read my blog recently, and informed me that I had his age incorrect. Oops! He is actually 42. At least I didn't make him older. Ha Ha! The years are going by so fast now, who can keep up? So, I am nearing my taper, not yet, one more tough week, but as I transition to this phase of my training, I want to work on being mentally tough for St. George. I see that I have 20 days to "toughen up mentally." I think this is the final piece, to putting my total package together. In training for St. George, I have dropped some lbs. and I am eating better than ever, I have upped my training in mileage, and intensity, this last month of training, I am doing unlimited yoga, I am doing core work and lifting weights. The final piece of the puzzle is - to be determined to push through whatever comes in those last 6 miles. As you marathoners know, "the race starts at mile 20." I need to be ready to push it, and "finish this race." This is where you can help. What do you do to become mentally tough for your race? Let me say, I am not competitive with other runners, so saying look in front of you, to the next runner, and go after them, doesn't work for me. I am only competitive with myself and my results. Recently, I posted a note on our local running club website about mental toughness. I like this one! "Pulverize the Monster" - will be one of the mantras I repeat in the last 6 miles. Also, I will use the following: "I am strong" and "Finish the Race"
Other than that, what else do you recommend? Monday - easy walk 30 min. Thurs - 5 miles easy, later morning run - (still trying to heat train - it may be hot by the time I make it back to St. George on race morning) yoga, core work. Sun- today I talked Audrey (the rabbit) to run with me. We ran a nice 5 mile run @ my pace 9:17, not her pace, which is much faster. Thanks Audrey, enjoyed catching up a little. So I ended the week with 25 miles running with 1 quality run, roughly 6 miles walking, 4 yoga classes, core work. Also, worked on getting my eating back in line. The marathon made me so hungry, I was "out of line" for a couple of days. This is ok, but needed to get back on track, especially with my taper coming up in the near future. By the end of the week, back to the goal weight. Really working hard to "stay right." Looking forward to your recommendations for mental strength to finish the last 6 miles. What a GREAT run in Tupelo, MS on Sunday. Do you see the "2 thumbs up?" Finishing time 4:18 for a training run - I'll take that! The great thing about a small marathon is that you can arrive about 20 minutes before the start, head to the potty, and have plenty of time to make it to the start. (I love that). Blogger, Bamarunner and I had exchanged "Tweets" about race numbers and "race day attire" prior to our arrival, so while walking to the start, I picked out who I thought might be him, and introduced myself, yep it was Mark. We had a few minutes to chat before the beginning of the race, and then we were off and running. 5am, dark, but the moon was bright, so it was not a problem to see the road at all. For the next 11 miles we chatted about running, races, family etc. After tweeting and blogging for the past few months, it was nice to meet another runner who shares the same crazy hobby. For the first 11 miles, we averaged around 9:42 pace. A little faster than I planned to go, and a little slower than Bamarunner had planned, but it really helped to make the time fly. At that point Bamarunner took off, and I immediately slowed to my planned pace of 10:00 min. per mile. For the next 12 miles I was right around 10:00 minute miles or slower. I stopped to take pics with the phone camera. How nice is that? I have NEVER done this in a race. "need some pics for my blog"
Uhhhh??? - not sure why all the pics are of the flats, but I promise I wasn't telling "a story" about the hills. Probably because I was afraid to stop at the bottom of any of the hills, might not start back. At mile 23, I was back on 10:00 pace per mile, exactly. I had decided early on, to finish the race at my planned race pace for St. George. So for the last 3 miles, I averaged 8:55 pace. That was the BEST feeling! I am always "trashed" at the end of the marathon, so to be able to pick it up, and feel good doing it, was a great feeling. Bamarunner finishes his training run for the day. Nice! I am fully aware that most marathon programs advise against going over 20-22 miles for training, but this is something that I have been debating and wanting to do for a few years. So now I have "gone and done it!" Will it pay off, not sure, but either way, I am so glad that I tried it. A great training run! So I ended the week with 63.2 miles of running. (Yay - new all time high for a week) 4 miles walking, 4 miles biking and 3 yoga classes. Great week of training! So it's Monday, yes I am a little tired, but I am really feeling good. This morning I went to help with the Labor Your Legs 5k, watched my hubby(age 41) finish the 5k in 18:01, 2nd place overall (and he's not even in race shape), and then went to get in my 30 minute walk. Walking the day after a marathon really helps to loosen up, and I think it speeds my recovery. When we made it home I immediately took a short nap, and will be lazy the rest of the day. I Already Have What I Came To Tupelo For! Now I can go home. Ha! I love this logo for this race. Just 3 short years ago, I thought anyone who would run a marathon in Sept., in MS, was totally crazy. Then 2 years ago the bug hit me that I had to have one of these tees. So now I can go home. Hee Hee! 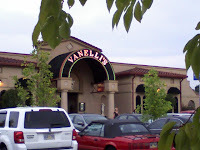 He had mentioned that he was going to eat at Vanelli's Restaurant Sat. evening. I didn't want to eat a big dinner late, so Chad and I decided to go for lunch. It was so worth the trip to Tupelo. Looking forward to a blogger meet up at the race in the morning. So between the shirt and the lunch - I'm a "happy camper" in Tupelo, MS.
About a 60% chance of rain on Sun. I don't mind the rain, just hoping for NO lightning. Oh, we drove the course, just as advertised, rolling hills the whole way. A few that look a little ugly, and I am sure will be larger tomorrow on foot. I am looking forward to it. 10:00 min pace, 10:00 min pace, 10:00 min. pace. (talking to myself) No racing this time! Tupelo Marathon here I come! So as of today, I have 37 miles and 3 yoga classes complete. Thurs. afternoon, Fri., and Sat. will be rest days, probably walking or riding the bike 30 min. After the run this morning I had an ice bath and green tea, I also plan to sneak in a nap today. The last 2 nights I didn't sleep very well, I think it's the moon. Really, many times when I do not sleep well, if I notice, the moon is full or almost full. Not sure why, although it's beautiful, it messes with me. quick trip, it will be nice trip with my honey. Tues. - 7 miles am, serenity yoga, 3 miles pm. This run was such a treat. Monday night I noticed the "almost" full moon and told Chad that I wanted to do a night run. So I went to the 5:30 pm yoga class, came home had a quick bite to eat, and waited until about 8:30 or 9:00 to go for my other 3 miles. It was so nice. Chad and Scarlett (our dog) joined me. Chad rode the bike. We were about 1/2 mile into the run and we saw a shooting star. After that we ran by the pond with the a color lighted water fountain in it. It was so pretty with the full moon and the lighted fountain. It was a magical run, except my breathing was much labored due to the eating a little too much before the run. Wed. - 8 miles with a 5 mile tempo run on hills @ 8:05 pace, yoga class. Wed evening the Pinebelt Pacers were getting together to run the "Labor Your Legs 5k course, and to stuff the bags for the run on Monday. Originally, I had said that I would not run this one, but when I arrived decided to jump in and run easy. Wed. evening - feeling very tired. Thur. 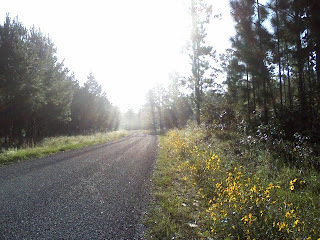 am - 6 miles at the Longleaf Trial (rails to trails). First flat run that I have had in a long time. Nice change of scenery and pace.